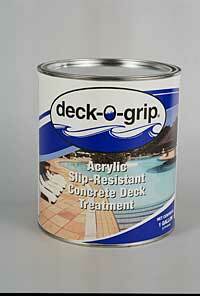 Deck-o-grip from Deck-o-seal, is a non-yellowing, acrylic-based, high solids, transparent, liquid cure and seal and is designed for various exterior concrete applications, including swimming pool areas and exposed aggregate. It provides a clear, flexible, abrasion- and stain-resistant protective film. It also offers improved resistance to most of today’s common pool chemicals. It is specifically designed to retain and enhance the appearance of colored concrete and exposed aggregate surfaces for years to come. The compound contains a slip-resistant additive. The compound is packaged in one-gallon cans and five-gallon pails.